I opened the plastic garden tunnel to take a look. 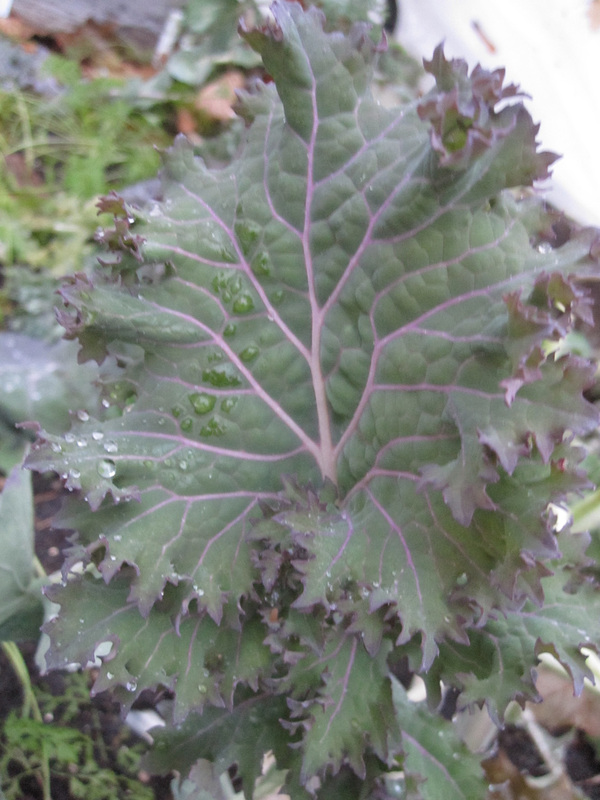 Much of December was dry and below freezing, but the kale is still alive. I harvested some at the beginning of the month and it’s still keeping in the fridge. Had great luck with a mixture of wild Siberian kales from Territorial Seed Company in Oregon. I’ll grow this again. Some is red, some is white, and the leaves come in different shapes from smooth to extra-curly. Also in the tunnel are carrots. I would have pulled some but the soil is still frozen. There are seedlings of lettuce and green onions. The seedlings will take off when spring sun hits the tunnel. The kale will revive. I’ll see what else appears in there. Today the soil was dry and I took advantage of the warmer weather to give it a good soaking. There was evidence of a cat scratching around, and I’m pretty sure I know who. The wet dirt will discourage him. As of bedtime tonight it’s still raining steadily. Tomorrow I will make a dish with kale, the wonder vegetable. Kewel! Kudos, too! “wild Siberian kales” … the thought is intrigueing.